CASE-2: Does Free Will Exist? Numbered tickets are issued the day of the Case and the first 20 arrivals can be spectators. Projects associated with "Constitution and Constellations - Turn Coat / Turn Court" With the collaboration of excellent domestic and overseas musicians, scientists, philosophers, and men of letters, events called the "Yokohama Trial" will be held throughout the period. The events are referred to with "case" in their titles. This signifies that the events are neither plays, nor lectures, nor performances. "Case" connotes a lawsuit, and in this instance we borrow the style of a courtroom to enlist the participation of our visitors as jurors (a total of 11 will act as jurors, those selected in response to advance announcement and those designated here) and as spectators (numbered tickets are issued the day of the case and the first 20 arrivals can be spectators). 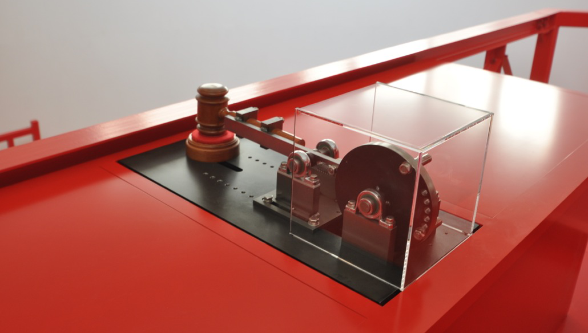 While the cases are being held, a sign saying, "In Deliberation" will be posted at the entrance of the red courtroom and entry into the courtroom will be prohibited. It is important that the other visitors not be allowed to enter the courtroom during deliberations; it visualizes the system of "exclusion and selection" as well as the fact that "by being excluded, the visitor is also participating in the game." Assistance: JSPS Grant-in-Aid 24320043 "Incomplete Musical Notations"
Participation is free. The event might be cancelled due to bad weather. 3 minutes walk from Minatomirai Station Exit 3. For details please see Yokohama Triennale 2014 ticket information. A record of these cases will appear on the home page at a later date.